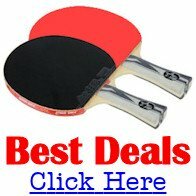 Table tennis tables are available in a bewildering array of styles and prices so, unless you know what you should look for, it's easy to make an expensive mistake and buy the wrong one. Table Tennis or Ping Pong? By the way, if you call the sport ping pong rather than table tennis, you may be interested to know that there is a subtle difference between the two names. In the early days of the sport (around 1890-1900) various names were used for this new game. Different manufacturers used different names and Indoor Tennis, Gossima, Whiff-Waff and Ping Pong were all early examples of patented or trademarked names. But as the sport developed and manufacturers began to enforce their patents and trademarks, a new name was required, so in 1926 the international sport of TABLE TENNIS was born. So although most people use the names ping pong and table tennis interchangeably, Ping Pong is actually a registered trademark and a brand of equipment used to play the sport of table tennis. 6 inches (15.25 cm) high. You should also note that the official rules of table tennis state that the table surface must be either Blue or Green. However, if you're just playing for fun it can be any size and colour you want. The playing quality of an indoor table tennis table is principally determined by the composition and thickness of the playing surface. Therefore my recommendations for the categories of Basic, Better and Best are based on a combination of the table meeting my minimum criteria for the playing surface (which I have set out below), and my personal experiences of using many different tables. However, as there are many table tennis tables in each category which meet my minimum criteria for the playing surface, other elements (such as the type of undercarriage) may be a deciding factor in choosing the table which is right for YOU. (I have discussed these factors in my downloadable book). The quality of an outdoor table tennis table is principally determined by it's ability to withstand the rigours of the weather all year round. The only table tennis tables which you should use outdoors are those which are specifically designed as outdoor table tennis tables. However, the composition and thickness of the playing surface will vary widely and so, therefore, will their playing characteristics. My recommendations for the categories of Basic, Better and Best are based on a combination of the table meeting my minimum criteria for outdoor use (which I have set out below), their playing characteristics, and my personal experiences of using many different tables. 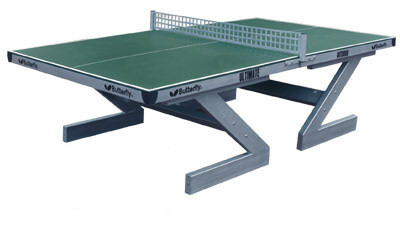 However, if you want the most durable, weatherproof outdoor table available, you'll need a concrete table tennis table. 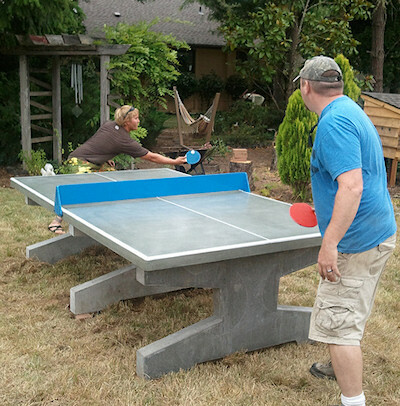 A concrete table tennis table will last approximately 50 years, whereas other outdoor tables may only last for one or two years. 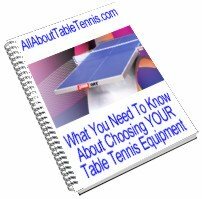 If you need more information about how to choose your table tennis equipment, and what you need to look for, I've set it all out in my downloadable book. It's 37 pages long and is available for immediate download here. If you have any problem downloading this report please contact me and I'll do my best to help you. You'll need Adobe Acrobat Reader installed on your computer to view my downloadable book.